The meeting between Pope Francis and Patriarch Kirill “is almost a defining moment for ecumenism,” Bishop Brian Farrell, the Secretary of the Pontifical Council for the Promotion of Christian Unity, told America magazine on the eve of this truly historic encounter at Havana's international José Marti airport, Cuba, on Feb 12. “Things that seemed impossible became possible, so we can be confident that even the difficulties between the Catholic and Orthodox Churches can eventually be addressed in a spirit of friendship and mutual acceptance, and be resolved,” the Irish-born Vatican bishop said. He has followed closely the Orthodox-Catholic dialogue in the pontificates of John Paul II, Benedict XVI and now Francis. This, the first ever meeting between the Pope and the Patriarch of Moscow and of All Russia is an event of immense importance for Catholic-Russian Orthodox relations. It is a milestone on the road to Christian Unity. To understand the reason why this has never happened before it is necessary to revisit briefly the history of Russian Christianity. That history began in 988 when the pagan Prince Vladimir of Kiev was baptized and many of his people too (as Robert Robinson CSP explains in his excellent work on “The Eastern Christian Churches,” which I have drawn on in writing this article). The faith had come to Kiev from Constantinople (then known as "the second Rome" after the Roman emperor had moved the). This Byzantine Christianity became the faith of three peoples who trace their origins to Rus’ of Kiev: the Ukrainians, the Belarusians and the Russians. Both before and after the schism Christianity flourished in Kiev but then, following the fall of Kiev to the Mongols in 1240, a new center of Christianity grew up around the principality of Moscow. And when Constantinople fell to the Turks in 1453, some began to speak of Moscow as ‘the third Rome’ which would carry on the traditions of Orthodox and Byzantine civilization. Then in 1547, Ivan IV was crowned as the first Czar of Russia and in 1589 Metropolitan Job was enthroned as the first Patriarch of Moscow (by the Ecumenical Patriarch Jeremiah). The Czars then came to see themselves as the protectors of Orthodoxy just as the Byzantine emperors once were. Patriarch Kirill is the 16th Patriarch of Moscow. Through the centuries since then, the rift between Eastern and Western Christianity continued, despite two major efforts to resolve it. The first major breakthrough in modern times came (during the Second Vatican Council, 1962-65) when Pope Paul VI and the Ecumenical Patriarch Athenagoras met in Jerusalem in 1964 and lifted the mutual excommunications between the two Churches. Friday’s meeting is the most important Catholic-Orthodox breakthrough since then. Its significance cannot be underestimated not only for Catholic-Russian Orthodox relations, but also for Orthodox-Catholic relations in general, and for the entire ecumenical endeavor. Ever since the Second Vatican Council (at which the Russian Orthodox had representatives) and in particular since the fall of Communism in Eastern and Central Europe, the Catholic side has said many times that the Pope was interested in meeting the Patriarch of Moscow. Attempts were made under John Paul II and Benedict XVI to arrange such an encounter, and it came close to happening on a few occasions, but obstacles of various kinds always emerged (such as those regarding proselytism, the situation of the Greek Catholic Church in the Ukraine, and also problems within the Russian Orthodox Church itself). Those problems scuttled these efforts and the Russian Orthodox insisted on resolving the problems before any such meeting could happen. Over the past seven years, however, a number of things have happened that have changed the ecclesial and political landscape. Kirill was elected Patriarch of Moscow and All Russia on Jan. 27, 2009, and Francis was elected Pope on March 13, 2013. Moreover, the presence of the Russian Orthodox Church (ROC) has been strengthened and consolidated within the Russian Federation and nearby countries and is growing in the West. It is estimated that today some 50 percent of the world’s 300 million Orthodox faithful belong to the ROC. Significantly too the ROC and the Russian leaderships have drawn closer together and President Vladimir Putin has met Pope Francis twice, in Nov. 2013 and June 2015. Many observers believe that Putin facilitated the encounter between Francis and Kirill. Another significant factor in the equation relations to the situation of Christians and other minorities in the Middle East that has deteriorated dramatically in recent years. They are now being persecuted, killed or forced to leave their homes. This is a matter of the utmost concern to both churches. So too is the situation in the Ukraine because of the conflict there, and here it’s worth noting that the Holy See steered a cautious course in relation to this conflict, ever sensitive to the Orthodox. There have been significant developments too on the Catholic side in recent years. Benedict XVI (who was highly respected by the ROC) resigned and Francis was elected. From the very beginning of his pontificate, the first Latin American pope presented himself as “the Bishop of Rome” and is constantly promoting “synodality” as the way forward for the Catholic Church in the 21st century. All this has been well received by the Orthodox, as has his humility and his gesture in bowing before the Ecumenical Patriarch, Bartholomew I, to receive his blessing in the Church of St George, at the Fanar, Istanbul, at the end of November 2014. It’s worth mentioning too that over the past two years there has been “an increase in cultural collaboration” between the two churches. Some have described this as “the diplomacy of music and the exchange of gifts” because it involved mutual visits by choirs, the exchange of professors, conferences and so on. All this contributed to building the new, positive climate in the relations between the sister churches. When then did the traffic light turn from yellow to green? About three months ago, not long before Christmas, according to some sources. Up to now the choice of place for the meeting has always been an issue to resolve as the ROC insisted on “a neutral venue.” This time, however, agreement on the venue came almost by coincidence some say; others attribute it to Divine Providence. The pope and the patriarch happened to be in the same area of the world, outside Europe, at the same time. Cardinal Koch was invited to Moscow before Christmas and the Patriarchate suggested Cuba as a possible venue, an opportunity. Cuba is an ally of Russia, and a suitable venue for the ROC which now enjoys a new and more constructive relation with Russia’s rulers. On the other side, Francis’ credentials on the island are second to none after his major contribution to the rapprochement between Cuba and the USA. Thus, an agreement was soon reached to hold the meeting in Cuba, and President Raul Castro was more than willing to act as host. Friday’s meeting will not resolve all the problems between the ROC and the Catholic Church. It is not meant to do this. Major tensions and theological differences still remain, including the one relating to the primacy of the Bishop of Rome and how this is to be understood. This question has in fact been the subject of discussion in the Catholic-Orthodox International Theological Commission since 2006, and the next meeting on this will be held next September. 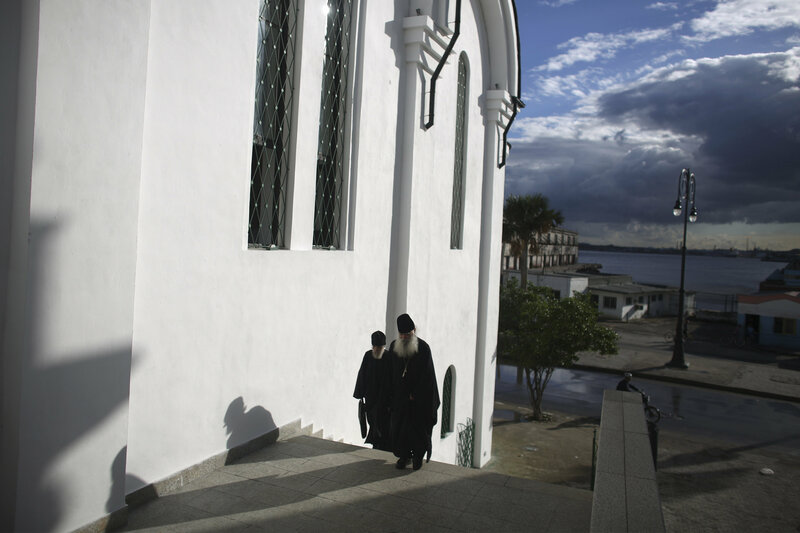 The Havana meeting, on the other hand, is not only a historical breakthrough in relations between the two churches, but—through the signing of a joint declaration, the Pope and the Patriarch offer a common Christian witness to the world as they address together a number of important issues that are of vital importance to both their churches. Those issues will be presented in the declaration that they will sign after their two-hour private conversation at Havana's international airport on Friday. It is worth mentioning that this meeting is not being held because of the Pan-Orthodox "Great Council" that will take place in Crete in June. Its genesis is completely different. Indeed, it was being planned long before that event was even decided, and it was in no way intended to enter into the question of the relationship between the Ecumenical Patriarch and the Patriarch of Moscow. Its importance is another; it is truly a landmark in Catholic-Russian Orthodox relations, and a hugely important step on the road to Catholic-Orthodox unity. By way of conclusion, it is worth noting that the Caribbean island which was once the epicenter of the most dangerous moment in the clash of the blocs will tomorrow make history in a very different way as it hosts the first-ever meeting between the Pope and the Patriarch, an event that is a major contribution to overcoming centuries of hostility and misunderstanding between these sister Churches. This beautiful island is about to witness the birth of a new solidarity between the sister churches that will enable them to face the tensions and problems, not only between them but also in the wider world, in a new collaborative way.